Arrive at Leh airport, meet and greet by our representative and transfer to your reserved accommodation. Check in to the hotel and get proper full day rest to get acclimatize.. O/N Leh. 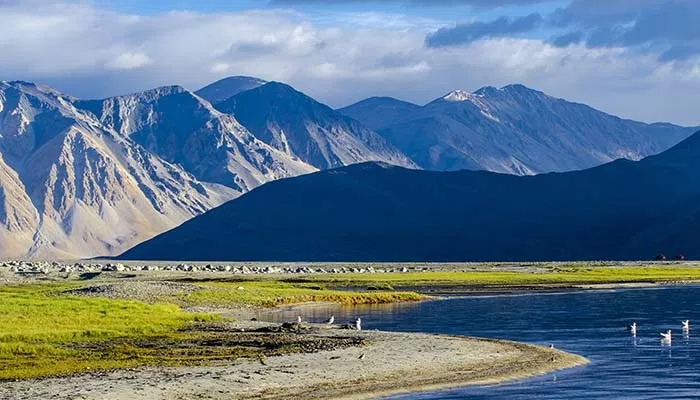 After breakfast proceed for an excursion to Sham Valley, visit Likir, Alchi Monastery, Sangam (Confluence of Zanskar & Indus Rivers, Magnetic Hill, Pathar Sahib Gurudwara and Hall of Fame museum. O/N Leh. After Breakfast leave for Pangong Lake 14,500 ft, drive of 6 – 7 Hrs. Arrival at Camp, Later free time at Leisure and enjoy the color changing lake and the sun set on the banks of lake. O/N Pangong Lake. Early morning enjoy the picturesque view of Sun rise on lake. After Breakfast drive back to Leh, en route visit Thiksey Monastery and Shey Palace. O/N Leh. After breakfast visit the Leh Palace ,Shanti Stupa and Leh Market. Later afternoon free for shopping. O/N leh.